Lately, we’ve been doing a lot of walking. 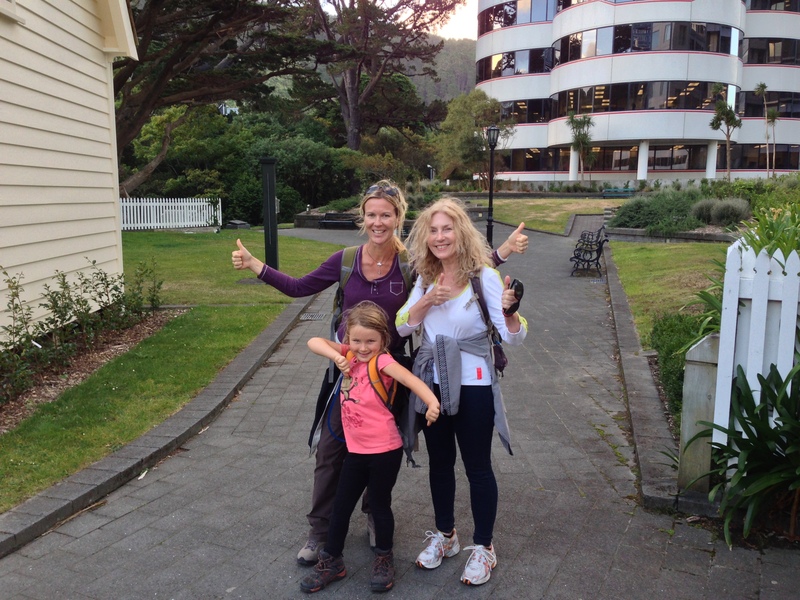 We’re a walking family, happiest when we can trade car transport for our own feet, and Wellington is a walker’s nirvana. That was the one downside of SE Asia. The heat was too oppressive to allow for walks much further than to dinner on the beach (but what a gorgeous walk that was). Two miles can feel like twelve in 95% humidity. 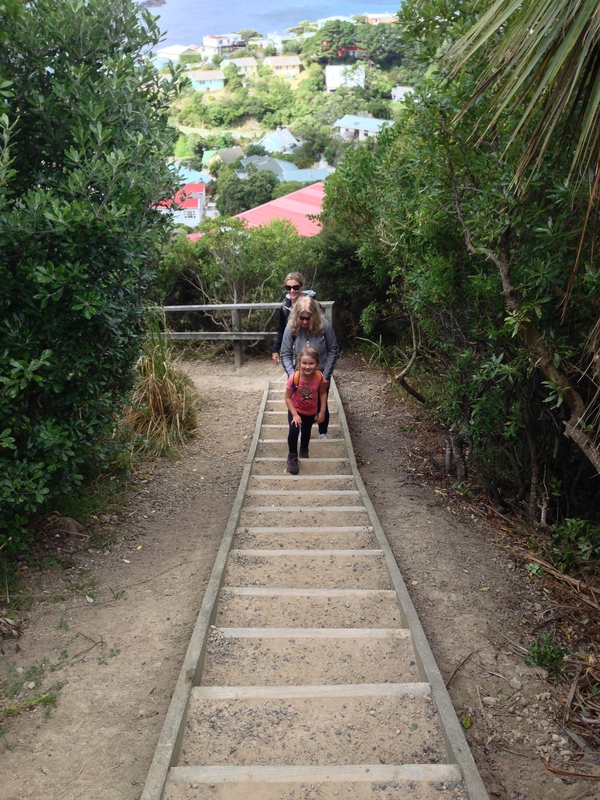 Wellington, on the other hand, was designed for walkers. 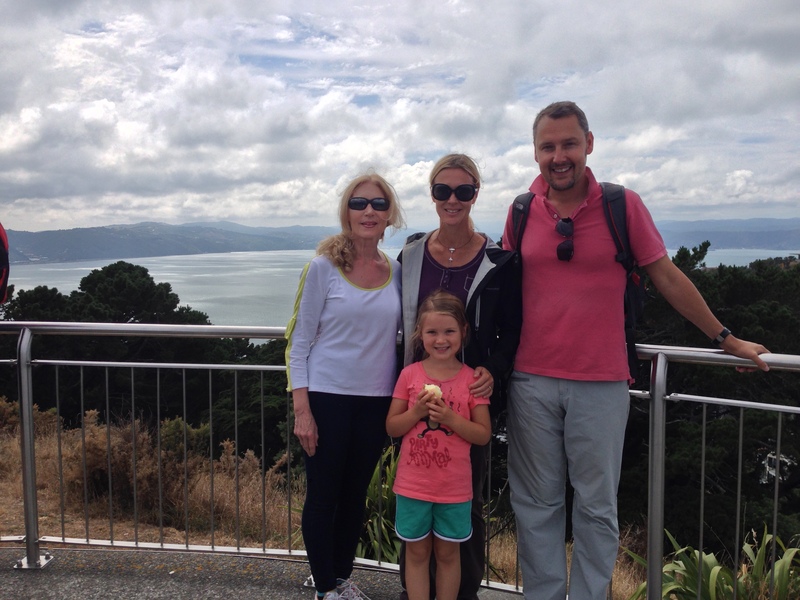 In Wellington’s temperate climate and with the wind at our backs, we have been criss-crossing the hills and valleys of Wellington and its environs. What we love about walking is that, like slow travel, the slower pace affords the opportunity to really get to know a place. To let it seep into your soul. 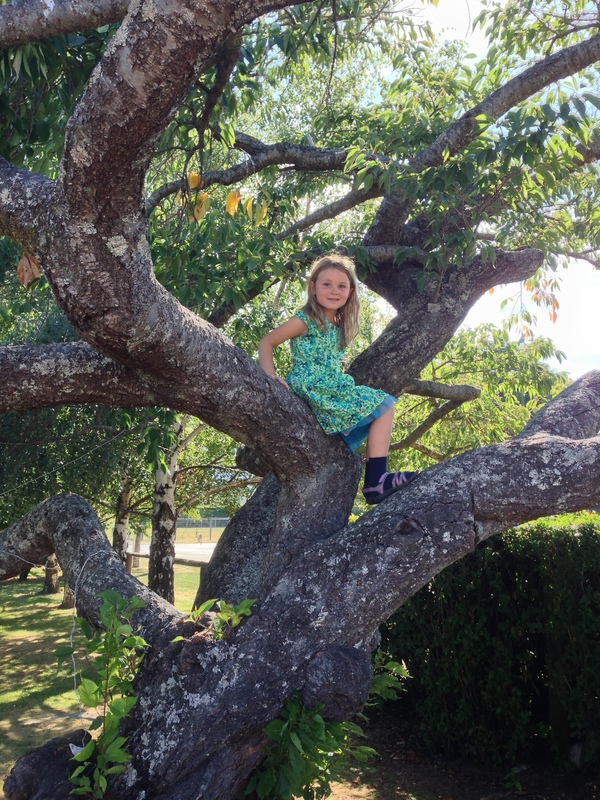 As we walk through the lush, forested woods, crossing charming neighborhoods and across local parks and playgrounds, we stumble upon cricket games, uniform-clad school kids walking home, 100-year old cemeteries, tui birds, nature reserves and totem poles. 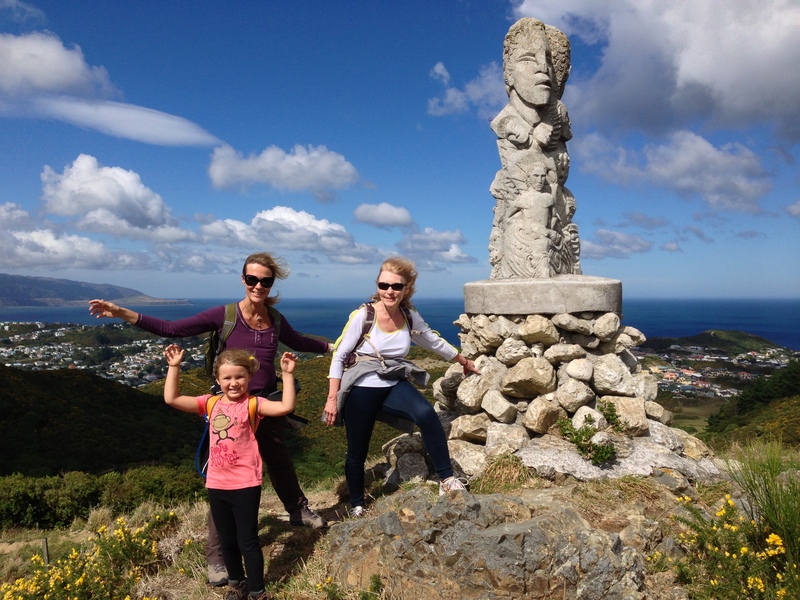 Each time we summit a hill, we are rewarded with far-reaching views of Wellington’s fabulous harbor or coastal bays. We’ve been greeted by rainbows and drops of rain, but no downpours. 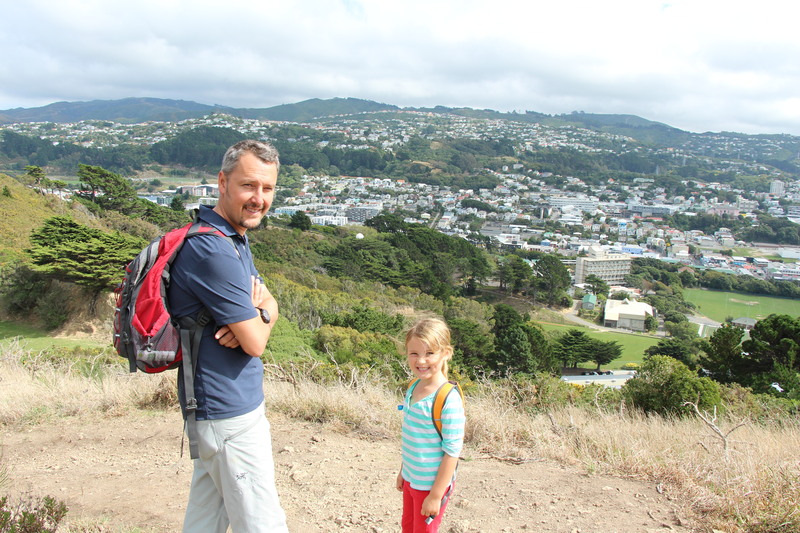 Wellington’s parks and trails are its birthright. Its founders, fleeing the industrial blight of England, were forward-thinking enough to foresee how public green spaces could enhance the well-being of its people. In 1840, they required that the city be separated from the country by a protected “town belt”. This town belt continues to serve as the backbone of Wellington’s walkways 170 years later even though the city’s limits have surpassed the belt. From the heart of the central business district, one can walk to several celebrated walkways within minutes. 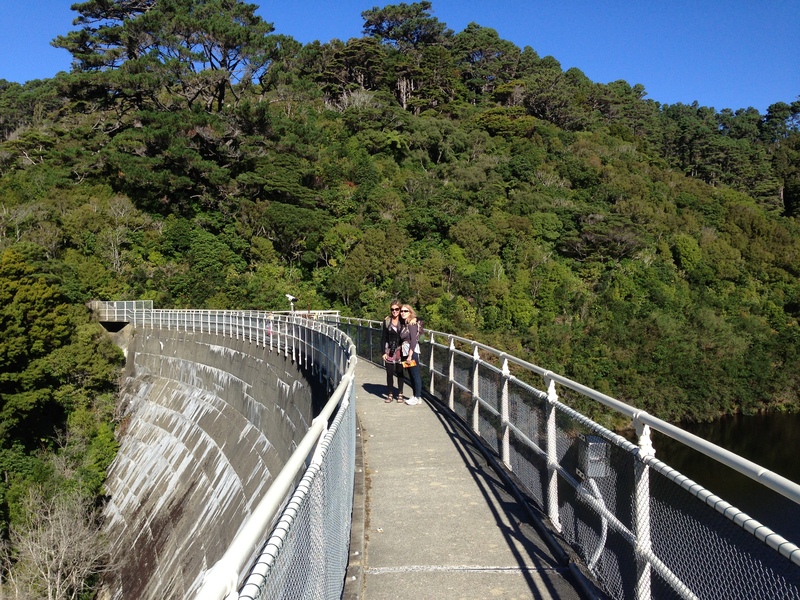 There is the City to Sea walkway, the Southern Walkway, the Skyline Walkway and even a section of the Te Aroroa trail (which traverses the entire country). 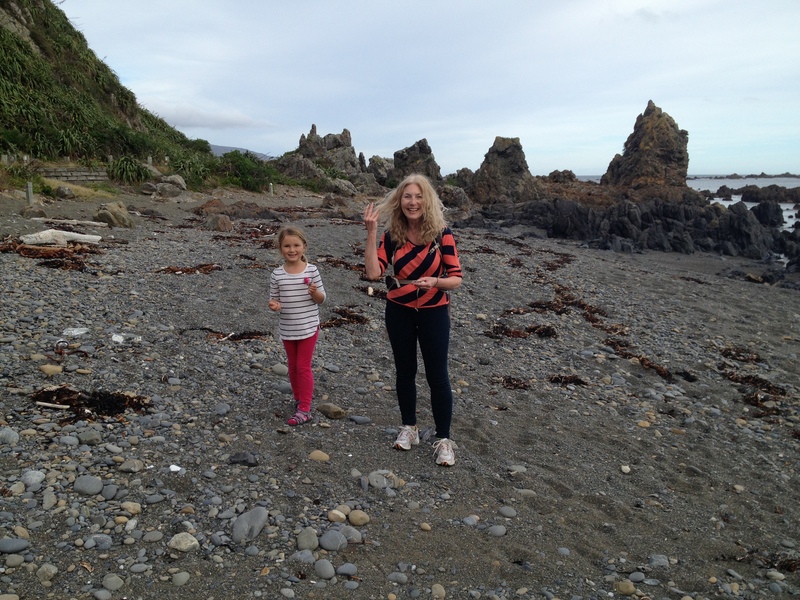 A couple of weeks ago we took all day to do the City to Sea Walkway in reverse, starting at the coast in Island Bay and heading back towards the city. The walk is 13km, but the path hops from hilltop to hilltop, necessitating repeated stairway climbs and descents so that the entire walk is the equivalent of climbing and descending the tallest mountain in England. 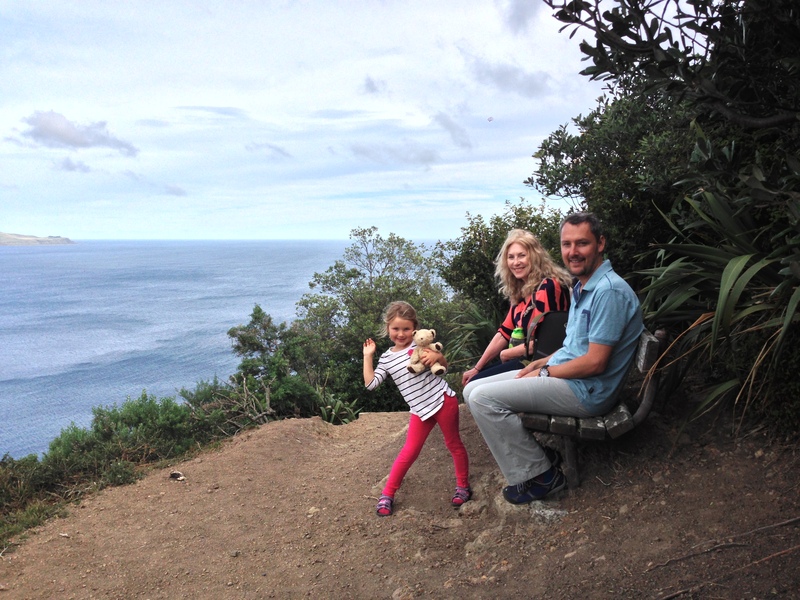 We’ve walked a portion of the Southern Walkway, which took us past roaring animals in the Wellington Zoo. We walked the Eastern Walkway which started outside the suburb of Seaton, and carried us above charming bays, past an Ataturk Memorial and deposited us on a pebbled beach where my mom and Zara collected armfuls of new treasures. 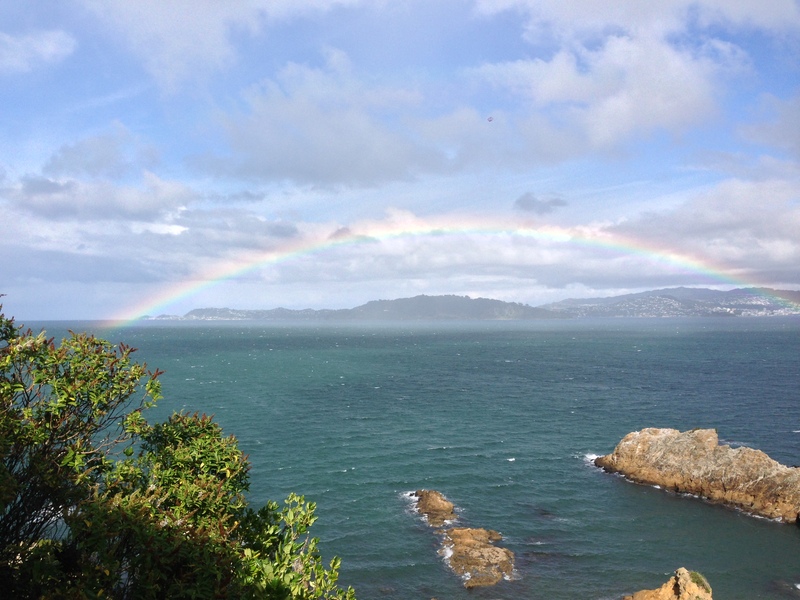 Today we took the ferry about 20 minutes into the middle of the harbor and walked around Matui/Somes Island, which has been used as both a people and animal quarantine in its past and now serves as a predator-free reserve affording stunning views of Wellington. Others days, we have just wandered with no particular destination in mind, focused solely on the journey and the next chocolate break. Tomorrow, we may tackle the more strenuous Skyline Walkway. We are down to our last four days in this marvelous little city. We already know that we’ll sorely miss its trails. Hanmer Springs: Hanmer Springs wasn’t even on our radar as we headed down through Lewis Pass towards the coast north of Christchurch, but I was starting to really feel the miles we’d logged during the preceding four weeks and was experiencing a serious case of road fatigue. Thus, when I saw the word “Springs” on a a road sign, visions of pampering not experienced since Thailand sprang to mind and I knew we had to stop. 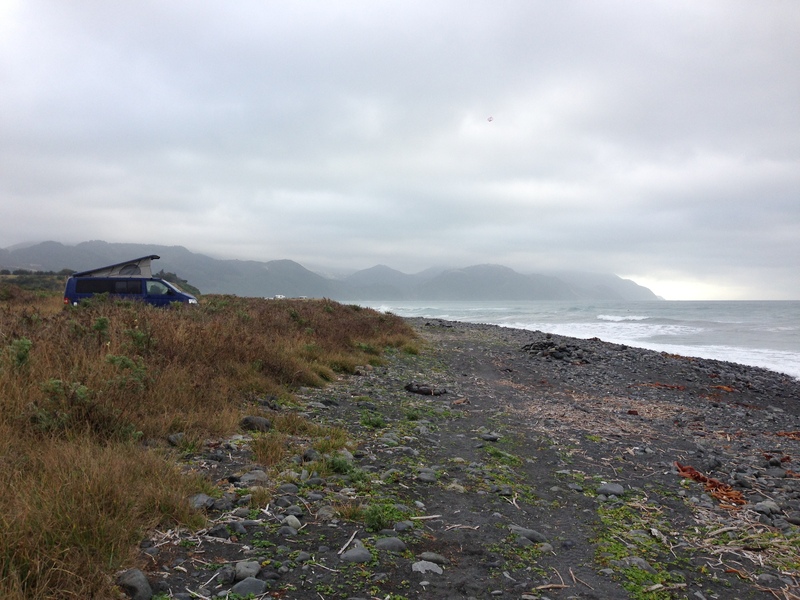 We parked Taranga at the local Top 10 campsite, which sold us on its proximity to the downtown. 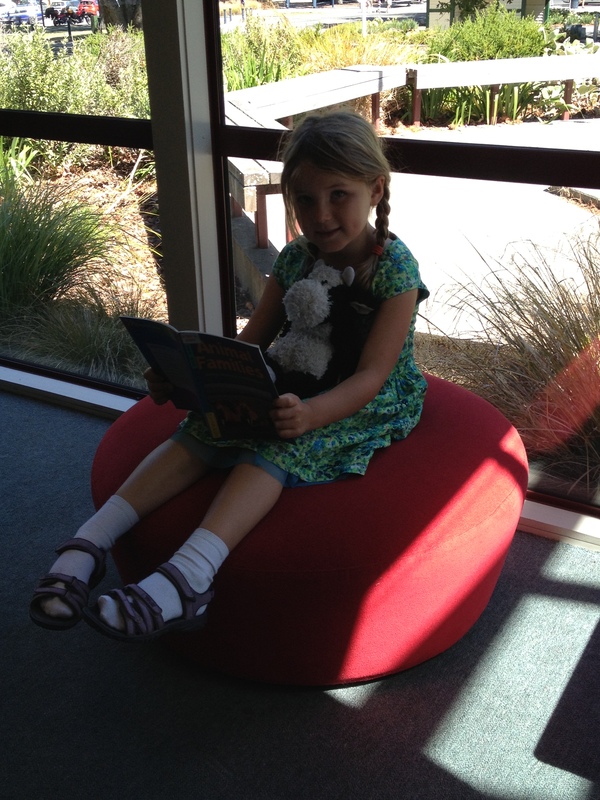 What I became most excited about after a short exploratory walk into town, however, was the library, with its siren call of high-speed internet, a bug-free atmosphere and free books for Zara. Yes, I know most people don’t travel to Middle Earth for its libraries, but long-term travel changes one’s perspectives and priorities. After our library fix, we headed over to the Hot Springs, where the facilities now include several large waterslides and a lazy river. Despite making herself as tall as she could, Zara just missed the 1.2 meter cut-off to be allowed a coveted wristband to go on all of the slides, but fortunately, she was allowed to go down the most thrilling one in a tandem inner tube so we avoided tears. The hot pools were relaxing, but in the bright sun, a bit less appealing than the ones we’d escaped to on a grey rainy day at Franz Josef glacier. Glow worms: West of Arthur’s Pass we stayed at Jacksons Retreat Campervan Holiday Park after I vetoed returning to Greymouth on the West Coast. It was a lovely camp site with gorgeous views, but we were back in sandfly territory. 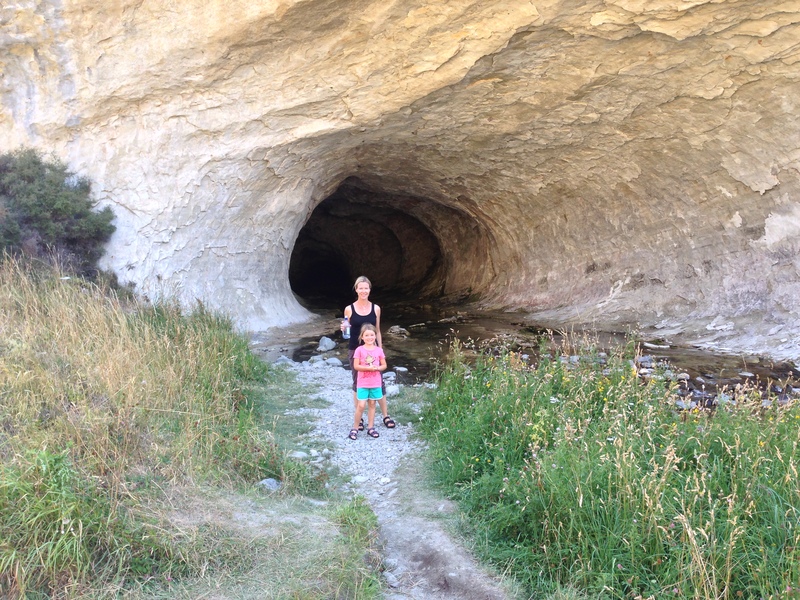 We did manage a 20-minute bush walk before dinner and the onslaught of flies at dusk on Ngarimu Walking Track to a waterfall and after 9pm we braved the elements again for a glow worm expedition. We stumbled around in the dark for 30 minutes and were about to give up when Jonathan saved the day and we saw our first (and so far only) glow worms. Swimming with Seals in Kaikura: This was just really cool. We’d heard from numerous travelers that swimming with the dolphins is a must as it isn’t one of the manufactured experiences you might have with Dolphin Quest, but the opportunity to swim in the wild with up to hundreds of dolphins. Unfortunately, being at least age 8 is also a must. So, after some quick research, a came across the swim with seals alternative, which strangely didn’t have the same age limit. 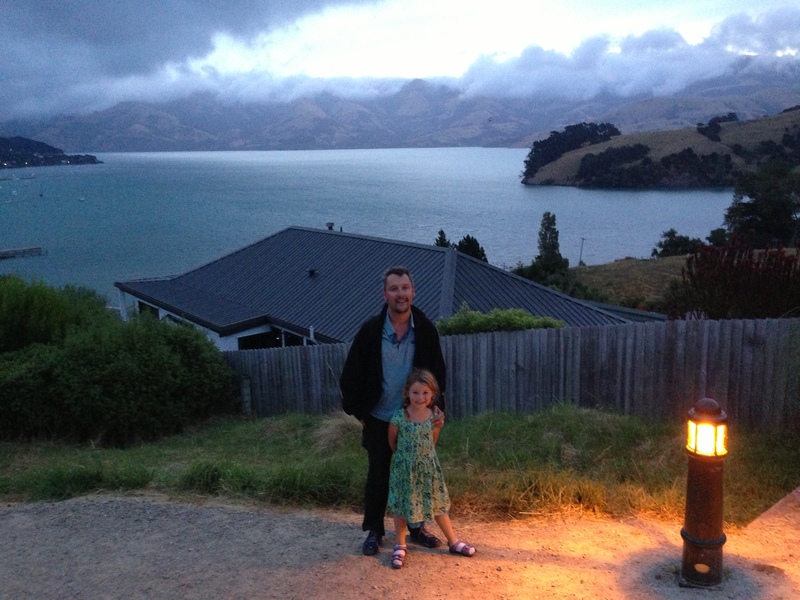 We went with Seal Swim Kaikura, a family-operated business, and it was fantastic. 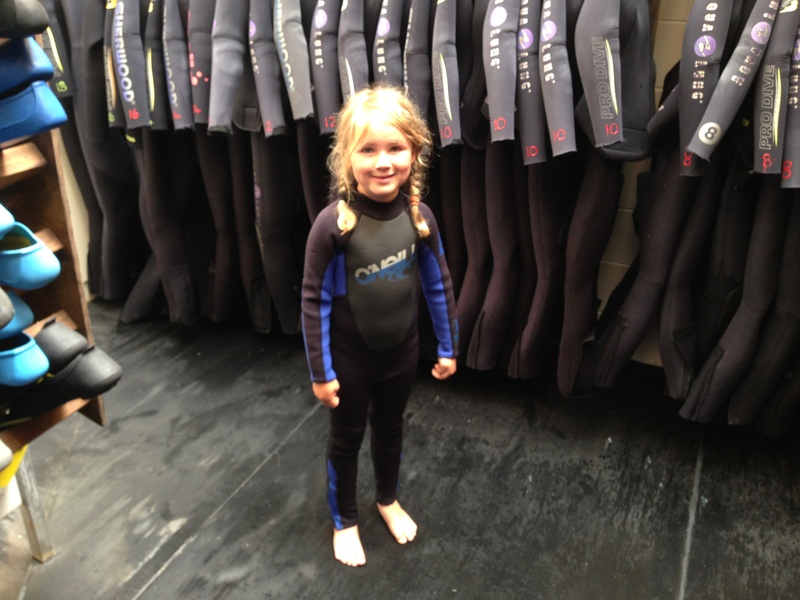 We all donned wetsuits (Zara was given three to put on!) to cope with the 62 degree water and headed out into the choppy sea on a small dive boat. The first seal colony we visited seemed more intent on sunning than swimming so we went further up the coast for 1/2 hour and I was thankful I had taken a Bonine. Initially, Zara was less than enthusiastic about jumping into the cold sea with rolling waves, but our patient guide worked miracles and soon Zara was expertly snorkeling around the rough waters and getting up close to the playful seals that did twirling dives around us. Unfortunately for me, my Bonine didn’t stand up to the challenge of me bobbing up and down in the waves for 45 minutes and I had to exit the water earlier than my 6-year old. Still, it was a fantastic experience and well worth a lost lunch. 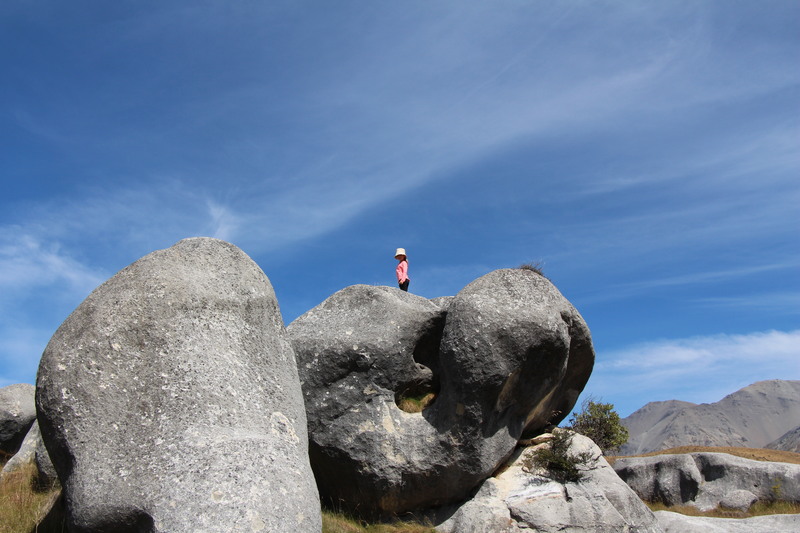 Castle Hill: A Narnia-like landscape of hundreds of large limestone boulders peppering the hillsides, where we had a fantastic couple of hours scrambling around on a hot day. Fun Fact: The Dalai Lama proclaimed this location a center of the spiritual universe in 2002. 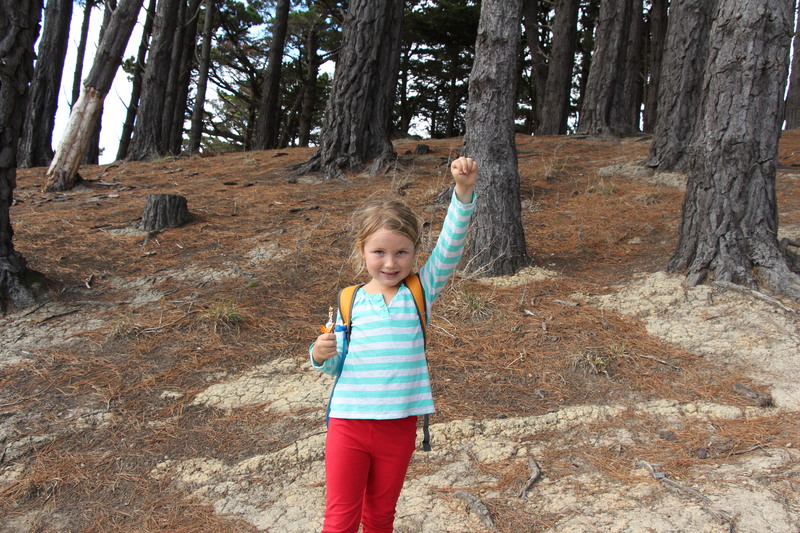 Less Fun Fact: Zara now wants to scramble up any large rock face she comes across. 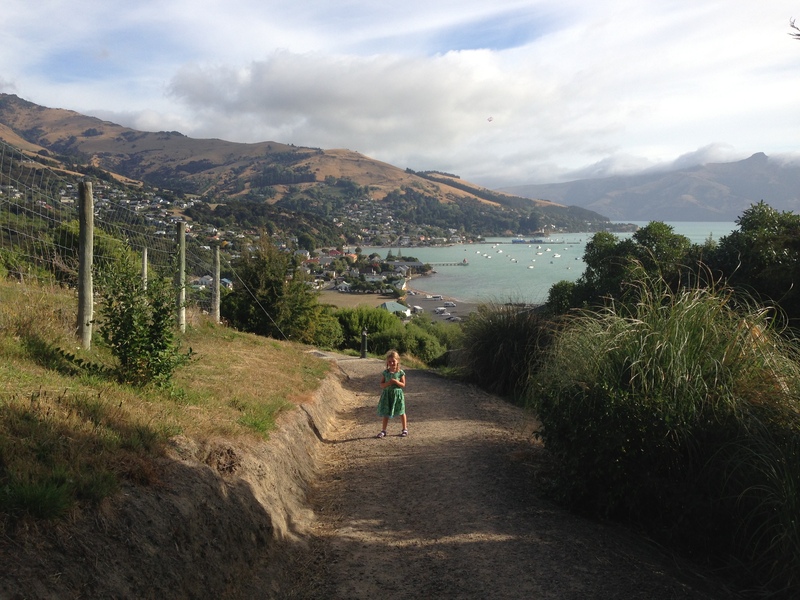 Banks Peninsula/Akora: This is where we spent our last day in the camper van. 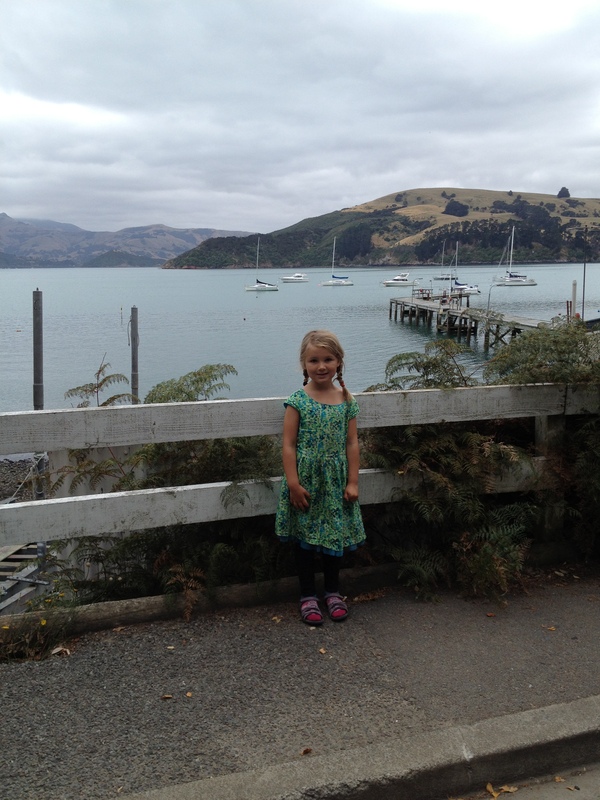 The Banks Peninsula is an easy drive from Christchurch and reminded us a lot of Pt. Reyes, although with slightly more developed towns such as Akaroa and a strong French influence. We celebrated our last night with a lovely dinner at Ma Maison on the waterfront. 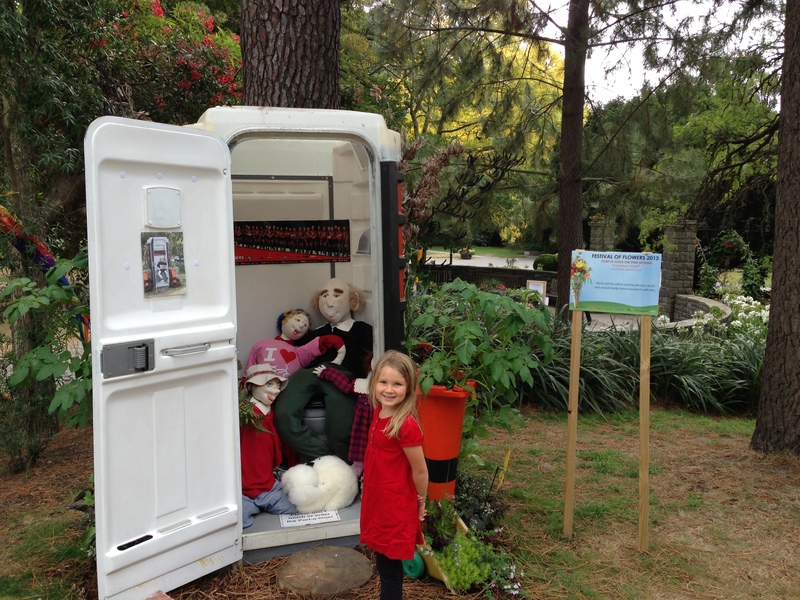 Christchurch: After dropping off our camper van, we spent two nights in Christchurch luxuriating in having a proper bathroom and private shower. It was surprisingly difficult to find a hotel room, as the effects of the devastating February 2011 earthquake in the city are still very apparent, but we lucked out with a very well-run motor lodge located near Hagley Park. 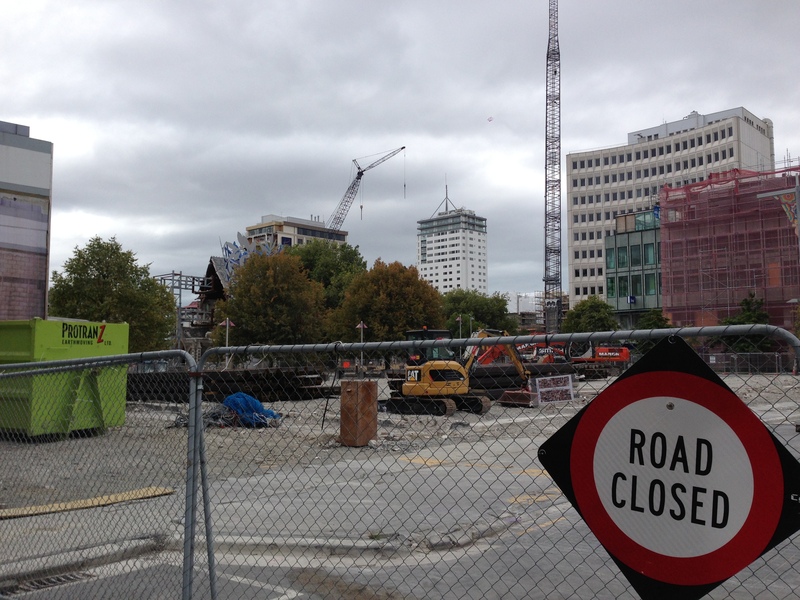 To be honest, there wasn’t a whole lot to do in Christchurch. We spent some time in the park and visited the Botanic Gardens. We walked by the Red Zone that continues to be cordoned off due to earthquake damage. Things just seemed really quite, although to be fair, we were there on a Sunday. 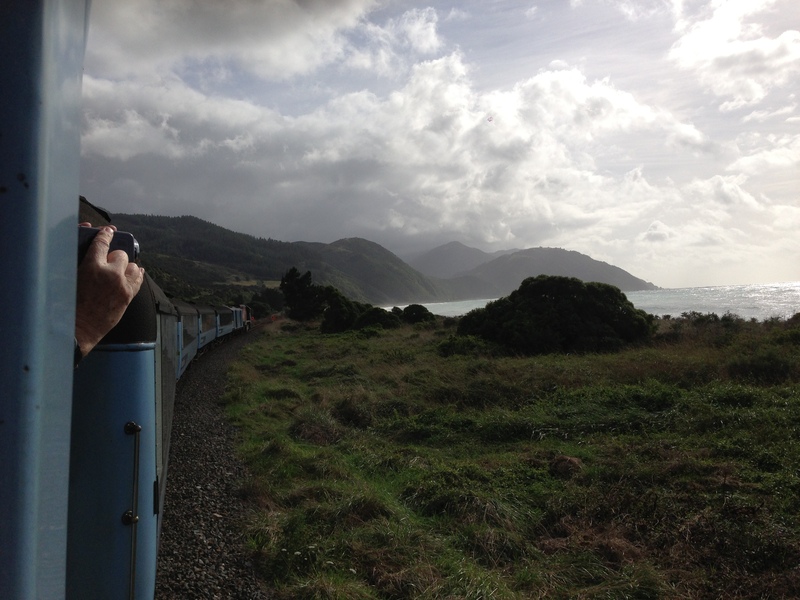 Coastal Pacific Train from Christchurch to Picton: Definitely a highlight. Our train ticket purchase came with a free hotel pickup to the train station from our hotel (hard to imagine that in SF!) and the train pulled out of the station as dawn was breaking. We had a bit of bad luck as a mechanical problem with the spiffy new train carriages meant we were stuck with a more dated version. Still, the scenery was stunning as we hugged the coastline for much of the 3 hour journey and the conductor pointed out scenic highlights over the speaker system, his commentary flavored with Kiwi zingers such as “We have beef pie for sale in the dining car, although it might taste a bit odd to Europeans because it’s made only from beef.” Train travel in New Zealand is definitely worth checking out, especially for those who don’t have the luxury of time for a full country camper van tour.